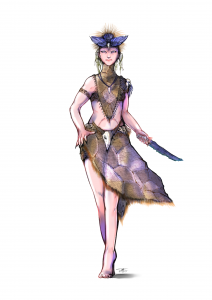 Hailing from a planet that has slipped dimensions by an event called the “Kitsune-Shift”, the pale-skinned Umvee keep to tribal traditions others see as savage. Their culture is considered archaic and ruled by a social hierarchy that is reinforced by genetic engineering. Umvee are Medium humanoids with the kemonomimi subtype. A Umvee’s natural biology rejects any and all cybernetics attempting to be fused with their body. Umvee suffer untreatable internal bleeding at the locations of connections with cybernetics until they are removed. However, their bodies do accept personal upgrades such as mystical crystals, nanite enhancements, and symbiote. Alpha: Bulkier and stronger, alphas start with a +1 racial bonus to damage when using a melee attack against KAC. Starting at 1st level, an alpha gains 1 Stamina per level. Beta: More social than the others, betas gain the Skill Focus feat for one of the following: Bluff, Diplomacy, or Sense Motive. Omega: Omegas hold the role of spiritual advisors and gain +2 racial bonus to Mysticism checks and receive a +2 on caster level checks. Zeta: Zetas are the hardiest of the birthright. Zetas receive a +2 racial bonus on saving throws against the following afflictions (curses, diseases, drugs, and poisons). The Umvee are historically a culture and tradition of natural predators. They receive a +2 racial bonus to Survival skill checks. Umvee can communicate telepathically with any creatures within 30 feet with whom they share a language. Conversing telepathically with multiple creatures simultaneously is just as difficult as listening to multiple people speak. In terms of sizes and shape, umvee appear no different from the humans of the universe they currently find themselves inhabiting. Umvee average around 5 to 6 feet tall, with the females being taller and possessing a slight tapering to the top of the ear. They all possess pale-white to light pink hairless skin, a sign of their foreign ancestry genetic engineering has been unable to remove. Alpha umvee support thick and elaborate tribal designs of black, purple, red, or blues, depending on the tribe from which they hail from. Betas tend to be more subtle in their skin design and prefer body piercings that are easily removed for interaction with other cultures. Omegas go through tribal brandings and scarification. Zetas are symbolic of the average Umvee wear their skin as a blank canvas. Strive to be the perfect genetic sample for your people. You understand you are designed for a role in a society and are proud to play it. Silently rebel against those that constantly lord over you without authority. Fight against those that seek to repress you from fulfilling your role freely. Fascinated by the new universe and cultures you find yourself in. Have trouble understanding the tribal hierarchy and how it can fit the new times. Discount your intelligence and aptitude to survive based on “primal” instinct. Appreciate your survivability and look to you as a leader in field exploration. Respect your ability to be overlooked. Umvee first arouse on their home planet alongside humans and their spiritual cousins the kemonomimi. They successfully fought with their kin them in wars against giant humanoids known as the Oni over control of hilly plains, lush forest, and the abundant water resources. As time past on the planet of Amorian, the humans and kemononmimi prospered and grew in technology. The Umvee stayed true to the old ways and continued ties to nature spirits of the natural order. The human empires came and went, seeing the Umvee spending a few hounded centuries enslaved to the humans off and on. Their cousins, the kemonomimi slowly slipped back to the forest to breed with those Umvee that remained free. As technology evolved it began to be revered by the human race as they slipped away from their natural gods. Some humans called for a reversing of course before the vengeful Kami could exercise their anger. In the last 300 years of human society, technology was at its pinnacle. The humans had built sky-ships to reach the stars, but still fought wars among themselves. The old Kami slumbered as technology gave rise to new Kami. The Umvee kept to their traditional ways and were left to the “Wylds” on a lonely continent the humans proudly avoided. It was during this silver age of technology that an ancient kami by the name of Daji, awoke. Fascinated by the new world, she walked with the humans and became disgusted at the lack of presence of the children she had birthed. The kemonomimi had all but been dissolved into the culture of the Umvee. It took some time, but Daji was able to find them and promised to give them back their world. And so she did. To the Umvee, it was not immediately known what had happened to their distant cousins. They neither cared, nor questioned her will, as Daji had returned to them. She brought them to a new star to orbit and two new moons to gaze upon at night. Over a short period since the “shift”, they started to quickly see changes to themselves. First, the living goddess purged any evidence to any other divinity but herself. The second change was felt mentally by all Umvee. Their minds began to develop more complex thinking patterns and the capacity to understand the science left behind. Daji taught them the knowledge she had acquired about the world left by the humans. The Umvee took to the technology quickly. Specializing in biological augmentation and genetic engineering to enhance their bodies. As a post result of the “shift” and through newly discovered genetic engineering processes, Umvee began to develop a limited type of mental communication, telepathy. The mental development would be the third and final evolution of the Umvee. Since their introduction into science, they have learned to engineer themselves for different environments found beyond Amorian. The Umvee began to explore the new moons and the surrounding universe. Umvee are a millennial old primitive race that has adapted to advanced technology only within the last 100 years. They have only begun to travel from their planet during the latter half of the current century. It was a struggle to integrate at first, but having a living goddess to teach them new technology allowed the Umvee to avoid certain mistakes that their human predecessors experienced. Under Daji’s guidance, Umvee ushered in a unique experience as a race and culture combining the old ways with the new. They are a peaceful people, avoiding wars amongst themselves, as that would lead to Daji’s direct intervention. In simple terms, they maintain their traditional tribal roles of hunters, shamans, and villagers. This has become even more defined with the introduction of genetic engineering. They live in a caste system of equality of alphas, betas, omegas, and zetas. Each contributing to their designed roles. Alphas are the warriors if needed and provide service of the heavy labor class. Betas act as the chosen society leaders and ambassadors to other worlds. Omegas keep the faith of Daji pure with direct communications to the goddess. They see to her demands for a clean and harmonious living with nature and keep order among what is left of the tribes. The Zetas fill all the roles not designated by the others. They are the bulk of society and are bred to be hardy and self-sufficient. Lead by this tribal caste system, umvee are a matriarchal society with their goddess at the head. Historically, they were organized into tribes, but have become more of an integrated community under one banner. They still tend to segregate themselves based the old ways consisting of three great tribes that contain many sub-tribes. Each tradition containing its own schools of thought concerning tradition, technology, and how to worship Daji. The largest being the Weika who look to look to keep advancing technology and exploring the world beyond. Wusan are the ones who look to maintain the current status and focus on the growth of Amorian. And then there are those who have returned to the “Great Practice” and have shunned all tech, known as the Shufei. Umvee are proud to share their customs of duty to society over personal gain with other races and teach the balance of science and nature. Preaching that biology is greater than technology and that later should never eclipse the first. Technology is a tool and should remain so. Umvee set themselves to be lawful neutral beings governed by a three-tiered philosophy. Does an Umvee’s actions fall in line with the teachings of Daji? Does it cause chaos to the larger community (be it companions or tribe)? Is it a selfish action that contradicts the Teachings for an end result only beneficial for self-gain? There are many that have lived off-planet long enough to understand that thinking of one’s survival can be more important than obeying an outdated code of conduct. Umvee look to keep their sacred bastion hidden, often traveling to many other worlds before returning home. Never returning the same way twice. This does make it difficult to establish trade routes, but their planet is self-sufficient. They travel to collect symbiotic creatures to help their evolutionary advancement while trading the bountiful variety of flora and fauna of Amorian. This has grown their relationships with the humans of the galaxy, despite the historic Umvee view that humans will go extinct and are mildly trusted. The kasathas, lashuntas and shirrens are welcomed allies that are respected for their common idiosyncrasies similar to the umvee, but are still warily of direct relationship and trade treaties. Vesek seem to get along with Alphas more than other Umvee. There is rare trade with Vesek, but are commonly avoided, while ysoki are the most intriguing of the known races. Umvee recognize a ysoki mastery of technology and admire their use of the tools. Androids are an abomination of the Teachings. Androids are tools and should never be treated as an equal. Though each tribe has a view on the topic, Umvee do have independent thought on what can consist of a tribe. Many umvee envoy seek to learn new things beyond their world and commonly go off planet on trade missions. Some return home, while others slip off into the black to discover never before experiences. More than once an operative stowaway has snuck aboard a ship bound for the heavens. It is not uncommon for Umvee to have visions given to them from Daji showing far-off worlds with unique creatures. These Umvee are requested to seek them out and return them home for studying. Umvee mystics of Daji look to spread her belief and teachings of the balance between technology and nature to those that listen. Alpha soldiers look to push their abilities to the limit in foreign environments. Umvee naming convention is both simple and complex, being made up of their birth name, then Great Tribe, followed by their genetic birthright. Formal names are more complex encompassing sub-tribes and order of birth. More often than not, umvee are called by their first names that are made up of double syllables when translated to Common. Some examples of Umvee first names are Aya, Boma, Cainei, Erba, Fama, Goa, Hanah, Kaime, Minki, Royo, Taya, Tohai, Toka, Uhoh, Xina, and Zaka.